Lakeview Health System's Dual Diagnosis Treatment Center is now licensed and certified by the Joint Commission of Accreditation of Hospital Organizations (JCAHO) with staff who are licensed social workers or PHDs. This is significant because many copy-cat programs provide a dangerously uneducated staff and lack licensing and accreditation by reputable organizations. 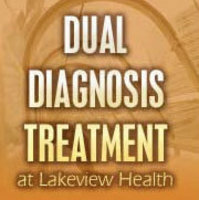 As Lakeview Health Systems' Dual Diagnosis Treatment Center earns accreditation by the Joint Commission of Accreditation of Hospital Organizations (JCAHO) and awarded the Gold Seal of Approval while others fail or don't even seek accreditation because of the inconvenient application process and the thorough facility research that is required. Whether it is due to stress, drug addiction, the deterioration of the family system a predisposition to psychiatric illness or alcohol addiction, the need for beds in the dual diagnosis program has skyrocketed. The dual diagnosis program has the ability to treat the co-existence of a psychiatric disorder, drug addiction or alcohol addiction. The existence of these disorders and addictions can make dual diagnosis treatment quite challenging. It goes without saying the better the dual diagnosis program, the better the likelihood of recovery. There are several licenses or accreditations a dual diagnosis program should have in establishing their credibility. First, every dual diagnosis program should be licensed by the State in which they provide dual diagnosis treatment. The department for each state license for dual diagnosis treatment will vary, but the state license for dual diagnosis treatment will exist. The license may be under the category of drug addiction or alcohol addiction treatment or a psychiatric license. Secondly, a dual diagnosis program should be accredited by either the Joint Commission of Accreditation of Hospital Organizations (JCAHO) or CARF. I prefer seeing the dual diagnosis program has been accredited by JCAHO and has been awarded the "Gold Seal of Approval". The Gold Seal states the dual diagnosis program is proving a high standard of care and can be ranked among the nation's best in providing dual diagnosis treatment. These two licensures takes into account the condition of the dual diagnosis treatment center, the quality of the dual diagnosis treatment program, policy and procedures of the dual diagnosis treatment center and overall patient care. Taking into account the dual diagnosis treatment staff is treating drug addiction, alcohol addiction, as well as, a psychiatric disorder they must be trained in several disciplines. The first disciplines the dual diagnosis treatment staff must understand are the dynamics of drug addiction and alcohol addiction. The staff treating addiction should have credentials of at least a master's degree or that of a certified addiction professional (CAP). If the clinician is in dual diagnosis recovery or drug / alcohol addiction recovery, all the better, but it is recommended they have several years of continual addiction recovery. Other credentials that are of importance in dual diagnosis treatment are that of being a licensed clinical social worker or Ph.D. This states the individual has the academic understanding of psychiatric disorders and in most cases, experience in treating psychiatric disorders. It is extremely helpful if these people also have a background in addiction recovery. Once you have looked into the licenses of the dual diagnosis program and credentials of the dual diagnosis treatment staff, you should investigate their psychiatrist, dual diagnosis treatment philosophy and additional services provided in the dual diagnosis treatment center. If you or someone you know is a candidate for dual-diagnosis treatment or any other type of non-specific drug addiction treatment, please call the Dual Diagnosis Treatment Center at 1-800-231-2950.